Some suspected armed robbers on Saturday shot dead a Catholic priest identified as Michael Akawu, in Gwagwalada area of the federal capital, Abuja. The robbers killed Akawu at a supermarket where he had gone to get some provisions for the parish rectory, the director of Catholic Communication, Patrick Alumuku, said. News of the death of Akawu, who was the first indigenous priest of the Catholic Archdiocese of Abuja, was first announced by another Catholic priest, Omokwugbo Ojaifo, on his Facebook page on Sunday. Citing a quote comprising eight words from a portrait painted by an artist, Salvator Rosa in the 16th Century, Ojeifo said the death of Akawu symbolises the frailty of the human existence. “Those eight words always remind me of the futility of human life. As the Psalmist says, ‘Human life is a mere puff of wind, days as fleeting as a shadow’ (Ps 144:3-4). Placed on the scales, we are lighter than air (cf. Ps 62:9). We are like grass which springs up and blossoms in the morning but by evening already withers and fades (cf. Ps 90:9). “This is our human story; this is the story of one of our young Abuja priest, Fr. Michael Akawu, the first indigene of Abuja to be ordained for our Archdiocese. He was shot dead yesterday evening by armed robbers at a supermarket in Gwagwalada where he went to buy some provisions for the parish rectory. Fr. 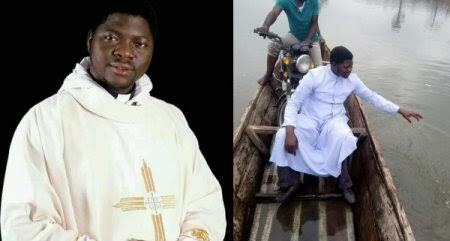 Michael was ordained in 2017,” Ojeifo said on his Facebook wall on Sunday. Alumuku who confirmed the shocking news, described the incident as unfortunate, and called on security agencies to be proactive in preventing crime.